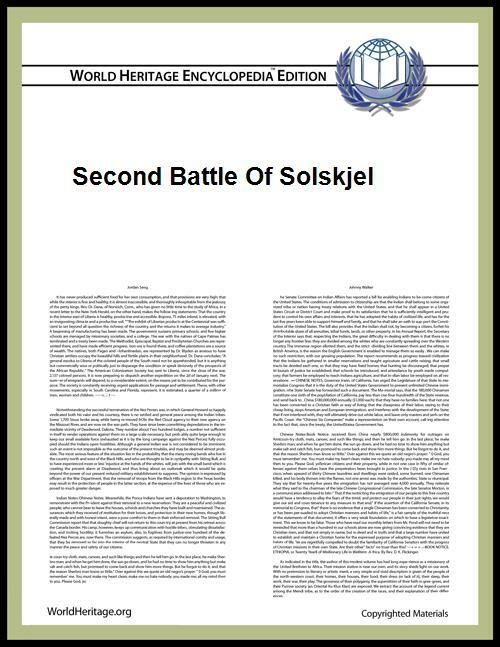 The second battle of Solskjell was an engagement in Harald Fairhair's conquest of Norway. After the first battle Solve Klove, son of king Huntiof set himself up as a pirate and spent that winter raiding and plundering king Harald's men and possessions on the Møre coast, king Harald himself had left to spend the winter in Trondheim. Solve had also spent time at the court of king Arnvid of Sunnmøre and they had gathered together a large group of people who had been dispossessed by Harald's conquest. The following summer Harald again gathered an army and sailed south. On hearing news of Harald's intentions Solve traveled to king Audbjorn in Fjordane and convinced him to join forces against Harald. The force sailed north to meet Harald by Solskjell. Here both kings, Arnvid and Audbjorn fell, but Solve again escaped. Heimskringla tells that Harald's men Asgaut and Asbjorn, his earls, and Grjotgard and Herlaug, the sons of earl Håkon Grjotgardsson, were all killed in battle. After the victory Harald took possession of Sunnmøre, and gave it to Ragnvald Eysteinsson Mørejarl. Solve resumed his pirate raids, and caused much trouble to Harald in several years after.